Have you ever felt like you’re blending in with your competitors, when you need to stand out? Or you are declining jobs because you don’t understand web design as well as you’d like? Are you stuck in an office, missing out on life? Or are you home with the kids, looking for a way to earn money for your family? Stick with me, I can help! Empowering women to take charge and confidently learn how to build and maintain web sites in their own business. This is where Web Hustle shines. I want to teach you how to build, manage and maintain web sites so you can support your own clients, all from the comfort of your own home! Aimed specifically at those small business hustlers with a ‘can do’ attitude, I share ‘how to’ videos, courses, ebooks and free downloadables to help you learn all there is to know about creating, managing and maintaining web sites. Not only is it chock full of valuable information, it’s efficient and cost-effective. Helping you access quality tutorials & workshops, so you can build the skills to get ahead! Web • Print • Digital • Coach • Mentor • Always Learning! Web Hustle is proudly supported by my husband, two Beagles and a foster baby. 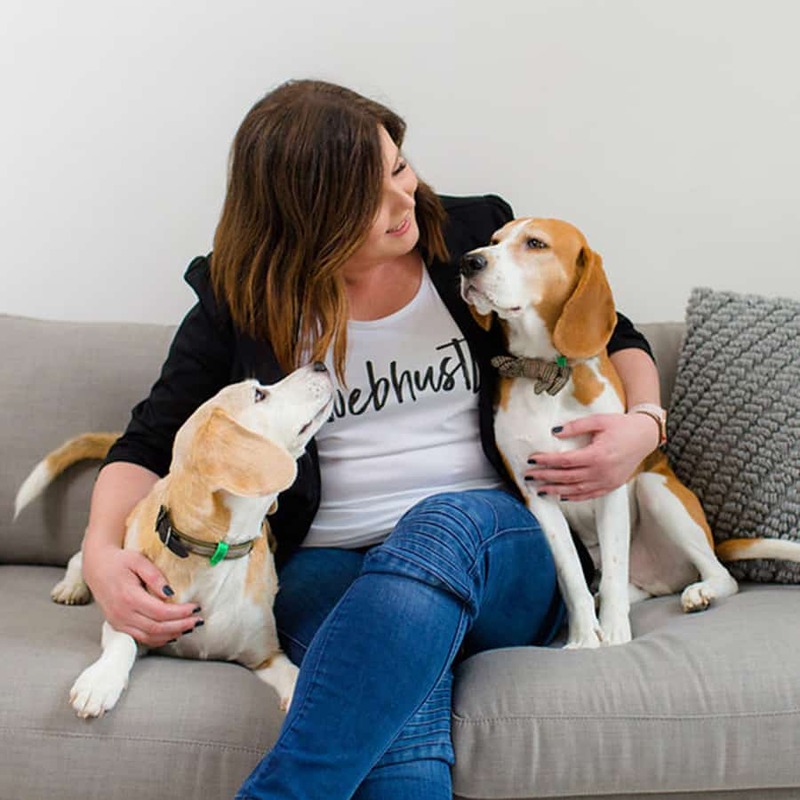 When I’m not working you will often find me pounding the pavement with my two CMM’s (Chief Mischief Makers, Beagles), snuggled on the couch binging on Netflix or sneaking off to a Pilates class whenever time permits. I’m professional Communication Designer specialising in digital & web design. I work with budding entrepreneurs, bloggers, startups, upskillers and established small businesses. I help them to build, grow and expand their business online. I’ve spent over 13 years working in a corporate technical environment, specialising in web server & content management where I was able to work with some amazing high-profile sites. Diagnosed with Ovarian Cancer at 33 was a big turning point for me. I didn’t want to spend my life in a cubicle, I wanted to enjoy life with my family and friends. So I clocked out of the 9-5, started my own web design business and returned to Uni to complete a Communication Design degree! Gulp! These days I work from my home studio in Richmond, just outside of the Melbourne CBD so I can continue my other joy, caring for foster babies. Meg has been my go to person for anything relating to my web site. She is professional, reliable, dependable & you can trust her to get the job done and more. I highly recommend her services and look forward to working with her for many years to come. We contacted Meg to re-vamp our web site. We are delighted with the results. The site is fresh & informative. Meg took time to listen to what we wanted and then put it into effect. This has resulted in much more enquiry resulting in more business via the new web site. We highly recommend Meg for any job small or big. Meg and her skills in digital design were and still are essential to our business and day to day operation. If there is a problem, Meg will respond efficiently and is quick to find a solution. Thanks for all your help – highly recommend! Meg is a delight to work with, she is responsive, switched on and creative. I would recommend her to anyone looking for a great value web designer.